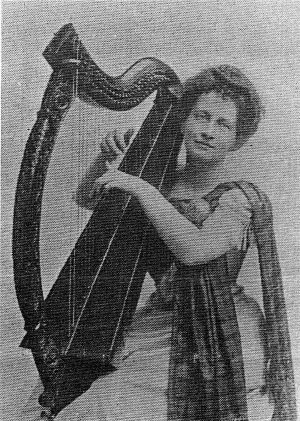 This picture from "The Celtic Monthly" (October 1902) shows Miss Amy Murray of New York, winner of the 1902 Dundee Mod, with a 28 or 29 string harp. This is the type of harp delivered to Archibald Campbell. It is a lever harp, that is, it has semitone mechanisms on the tops of the strings. It has gut strings, and a round backed soundbox like a pedal harp. Its forepillar is highly decorated with carved designs in imitation of the medieval Queen Mary harp. Note the classical "thumbs up, fingers down" hand position). Picture � Keith Sanger, used with permission.